without letting her know. Pretending to be Rachel "Winnie" Winfield's assistant lets Ellie stay close, but there's an unexpected complication—Colt Winfield. Winnie's grandson wasn't in on the plans, and the suspicious marine biologist isn't easy to fool. When the truth comes out, so do more threats to Winnie's life. Trapped on a Colorado mountain, Ellie and Colt must trust each other to guard Winnie and find the stalker. Before this Christmas becomes their last. 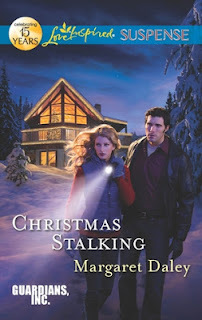 I was in the mood for a romantic suspense and with the holidays coming up how could I resist a book called CHRISTMAS STALKING. I did get more then I expected as technically this book should be listed under Christian Fiction. Luckily the storyline was good enough that all the mention of faith and God didn't pull me out of the story. I just think that mention of this fact should be brought up so the book can be correctly filed. As I said before this book has a very tight plot with some very enjoyable characters. I just loved Winnie and her frustration when everyone around her tried to protect her and not let her know what is really going on. Colt is strong yet tender and protective of those he loves. Ellie has been scarred by her past yet this family manages to scale the walls that she has built to protect herself. The plot itself is very tight and filled with suspense. They never knew just where the next blow would come from. The dialogue was crisp and right on target. All in all this was an enjoyable book to read. I rate this book a 3.8 and would have rated it higher if there had been any mention that this book fell into the Christian genre of writing.